Panthera Tigris Corbetti . You won't meet those tiger is Taman Negara, because they like to stay in the thickly jungle on the Peninsular. It comes out of its habitat to look for food. Most of the time, it goes for easy prey such as kancils. and goats. Taman Negara is a safe haven for the endangered feline, at least for the next 100 years if there is no poaching of tigers and their prey . Abdullah was the fifth tiger victim in Kelantan this year. So far, three other villagers have died and one is missing. The attacks spread fear throughout the area, with villagers refusing to work their land without protection . E xperts say increased land clearing in recent years has become a major threat, endangering the tiger's habitat. Perhaps with the economic slowdown there is extra pressure on land clearing because the government is encouraging agriculture. We always say the tiger encroaches into human areas. But we are actually the ones who are encroaching on their habitat. 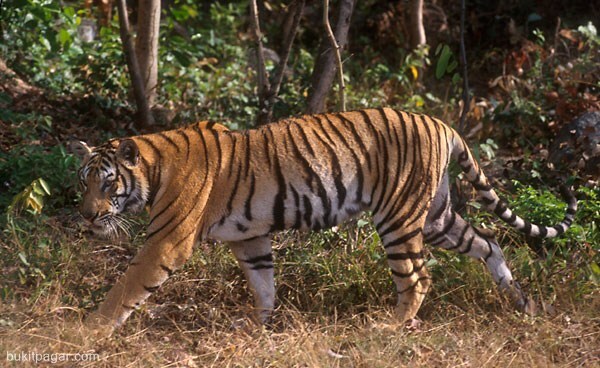 The Indo-Chinese tiger is the only species in Malaysia. 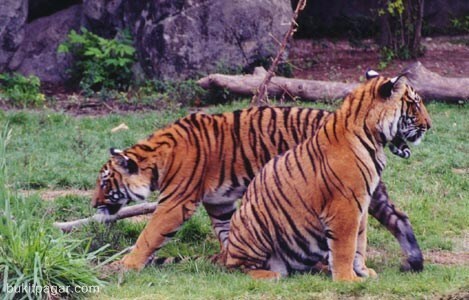 Of the 2,000 Indo-Chinese tigers in the world, about 500 roam the jungles of peninsular Malaysia, Perhilitan estimates. Historically, the world's largest cat has been revered in Malaysia as a symbol of strength and power. The country's royal crest portrays two tigers on either side of the coat of arms. Tigers are highly endangered. Globally, some 5,000 to 7,500 survive in the wild, according to WWF Malaysia. They are a bit smaller and darker than Bengal tigers, with shorter, narrower stripes. Their average weight is 180 kilograms (400 pounds).